I mentioned in my previous blog post about how I’ve been getting compliments recently on my complexion! 😀 I mean, everyone loves compliments, me included, so I was really very happy to hear comments from friends and readers who said that my complexion has been looking very good lately! Especially when I’ve been plagued by super bad skin problems since the beginning of the year. So glad that the skin is starting to look better! I have to attribute the clearing up of my breakouts to being on Roaccutane (I’ve been on Roaccutane for more than 5 months now) and it has helped a lot with the acne problems! Roaccutane does give me very dry skin and lips though 🙁 But I’m thankful that the breakouts are much better, though I’m still dealing with some pigmentation and pimples here and there! However, I believe that the reason why people have been complimenting me on the complexion lately is actually due to the products that I’ve been using, and I can’t help but to rave about this new groundbreaking product: Lancome Teint Visionnaire Skin Perfecting Makeup Duo!! I have always been a fan of Lancome foundations (Prior to this, I was using Lancome Mat Miracle) but this has got to be my favourite Lancome foundation yet! Plus.. It’s actually skincare AND makeup.. Two in one! And yes, you probably guessed it already, it contains the revolutionary Lancome Visionnaire ingredient, LR 2412! I’m sure I’ve also mentioned several times that the Lancome Visionnaire Advanced Skin Corrector Serum is one of my favourite serums, so I think it’s really cool that my makeup can now complement my skincare, and help to further enhance the benefits of the Lancome Visionnaire products that I’ve been using! Here’s a little surprise: The thick silver cap of Lancome Teint Visionnaire actually serves a purpose! It houses the High Coverage Precision Corrector, which is to be used hand-in-hand with the Lancome Teint Visionnaire Sheer Perfecting Foundation! 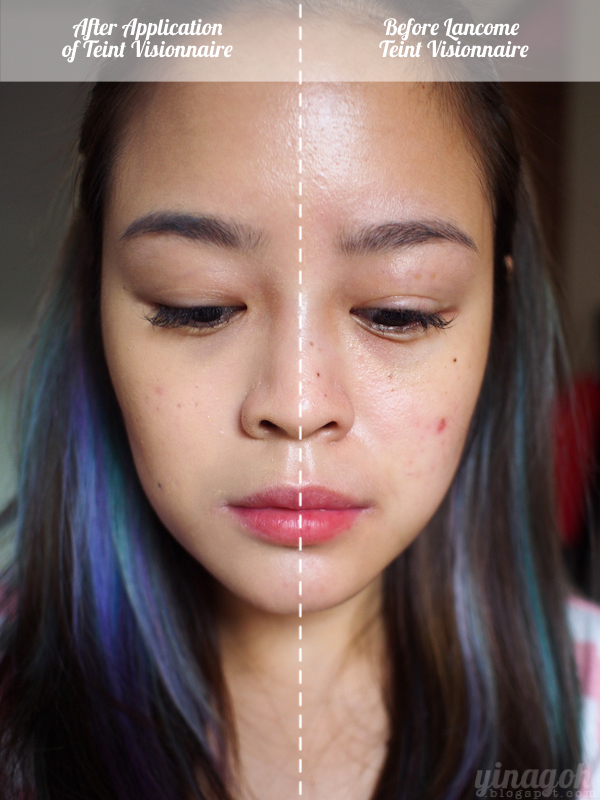 The corrector tone is matched to the shade of the foundation too, which is definitely a plus point. I am an O-02 for most Lancome foundations, and the same for Lancome Teint Visionnaire. It blends in perfectly with my skin colour, though the foundation itself looks slightly darker and with a stronger yellow undertone in comparision to the Mat Miracle. So what you’re supposed to do is to first use the corrector on targeted areas such as dark spots, dark eye circles and blemishes. The texture of the corrector is creamy and smooth, and goes on easily on the skin. I like to apply it with my fingers, as the warmth of my fingers helps the corrector to spread and blend better. I usually use the corrector around my nose (where I have redness), on blemishes on my cheeks and chin, and on my under eye area. The corrector actually contains Vitamin CG, which is supposed to help improve the appearance of dark spots! I find that the corrector helps to correct redness and conceal a little, but doesn’t provide high coverage for the really bad blemishes and my dark eye circles. After that, I pump out about one full pump of the Lancome Teint Visionnaire foundation, and apply it with the same Sigma Flat Kabuki F80 that I use with all my foundations! It is my favourite foundation brush, and I find that it gives me a flawless application. You can purchase the Sigma F80 on Doll To Doll Cosmetics! The texture of the Lancome Teint Visionnaire foundation is quite runny and light-weight, it definitely doesn’t feel thick at all! With the Sigma F80 brush, I pick up the product from the back of my hand, and apply it with circular buffing motions on my face. For areas that need more coverage, I either stipple (using the brush to dot repeatedly on the same area) or go over it again with a light buffing motion. I have got to say, the coverage for Teint Visionnaire is pretty amazing! You can see a stark difference with just the Lancome Teint Visionnaire corrector and foundation only! This is a half-face comparison. As you can tell, my skintone has been evened out visibly, and takes on a smoother and more poreless appearance. Redness is also reduced (especially where I have blemishes and around the nose) and my skin looks a tad bit brighter, but not to the extent that it looks scary white. With Lancome Teint Visionnaire on the entire face. 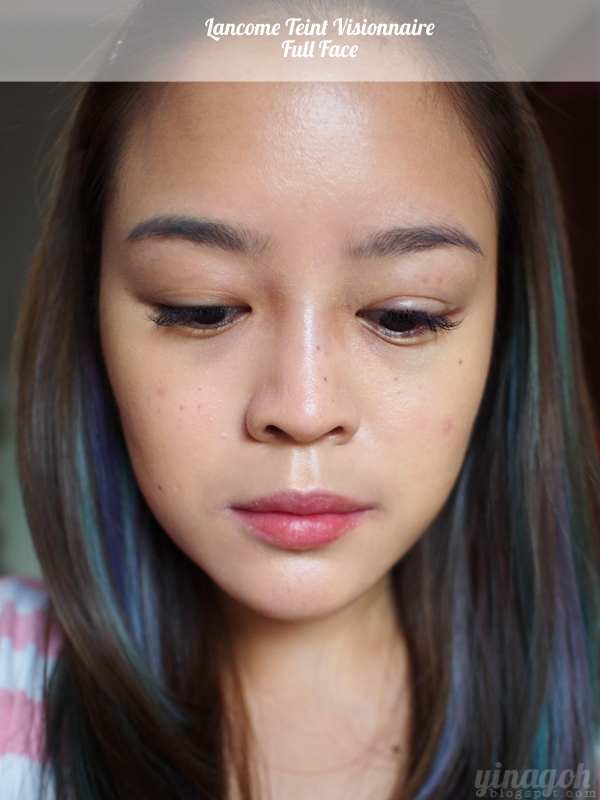 Check out how the previously obvious blemish on my cheek is now almost concealed totally! D: My entire face looks practically flawless already, and this is even before concealer! It’s amazing, isnt it? What I really like about the Lancome Teint Visionnaire is that it provides very high coverage (it is supposed to provide the most coverage out of all Lancome foundations so far) but still has a dewy finish to it. That makes it look very natural, and almost like your second skin. Which is probably why people have been thinking that my skin is so good! 😀 It’s actually the Lancome Teint Visionnaire at work! By the way, this photo is totally unedited except for some contrast and etc. My skin really does look like it’s flawless! And I can’t be sure if it’s just psychological, but I do feel that the skincare properties of Lancome Teint Visionnaire are slowly helping to transform and perfect my skin too! Introducing to you the entire Lancome Visionnaire Skincare range.. I LOVE these products! I use the range every morning before my makeup application now, because I feel like it makes for a complete Visionnaire experience, now that I’m using the Teint Visionnaire foundation! The Lancome Visionnaire Correcting Polishing Cream is pretty cool, it comes with its own polishing pad that helps to retexturize skin and polish away imperfections! The polishing pad is designed for a dual mechanical action, with more than 2000 micro-grains on one side and ultra-smooth on the other side. I love the texture! Easily absorbed and feels so hydrating. Visionnaire Yeux is a new product in the Visionnaire range, and it is supposed to achieve skin perfection while reducing dark circles, wrinkles and fine lines in the eye contour! Comes with an interesting rubber applicator, but I find the applicator tricky to use, and prefer to use my fingers instead! 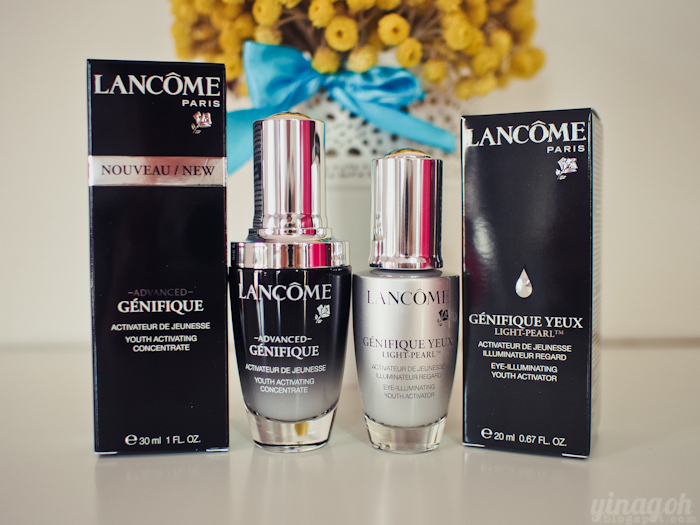 Lancome Visionnaire Yeux is available at $98. 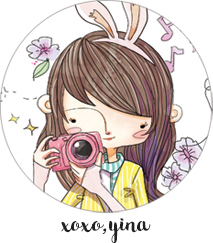 This weekend is super exciting because I’m flying to Medan for a wonderful person’s big wedding day! Whoop whoop! And I’ll be there with some of my awesomest “colleagues” and friends too! Flying off tomorrow afternoon and I haven’t packed yet. Meh. Enjoy the weekend ahead, peeps! Next Post NESCAFE Dolce Gusto Asian Design Contest!